The Inter American University of Puerto Rico announces its 2014 Summer Law Program. The Inter American University of Puerto Rico will host the summer program Immigration, Human Rights and Maritime Law in the Caribbean. 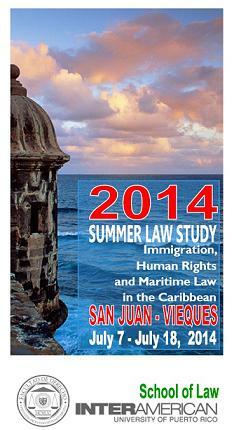 The two-week program will take place in San Juan and Vieques, Puerto Rico from July 6 to July 20, 2014. Students will have the opportunity of taking up to 4 credits in Immigration Law, Human Rights and Maritime Law taught by local faculty experts on their fields. The courses will combine class-room and experiential learning, visits to points of interests and guest lecturers. Along with the courses, students will have an exceptional cultural experience. We offer Spanish language instruction and a cultural immersion program at no additional costs. The courses are taught in English and Inter American University is an ABA approved Law School. Deadline for application is April 28, 2014. For application contact Ms. Angela Torres, Director of Admissions, atorres@juris.inter.edu.